Open Network Operating System (ONOS) is "a software defined networking (SDN) OS for service providers that has scalability, high availability, high performance, and abstractions to make it easy to create applications and services." The open source project is hosted by the Linux Foundation. Mininet and onos.py workflow describes how to run ONOS using the Mininet network emulator. Mininet allows virtual networks to be quickly constructed and is a simple way to experiment with ONOS. In addition, Mininet flow analytics describes how to enable industry standard sFlow streaming telemetry in Mininet, proving a simple way monitor traffic in the ONOS controlled network. 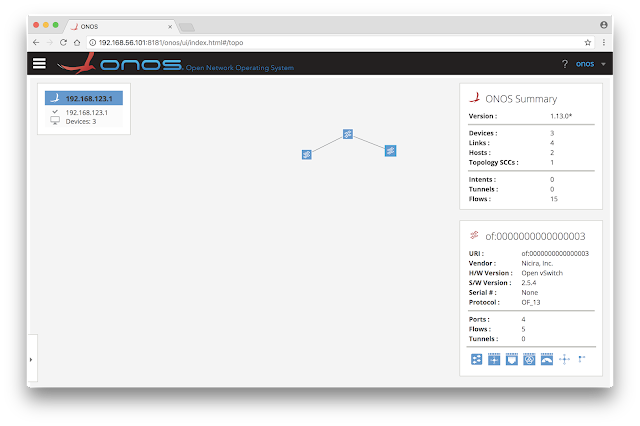 The screen capture above shows the network topology in the ONOS web user interface. Install Mininet dashboard to visualize the network traffic. The screen capture above shows a large flow over the same topology being displayed by ONOS, see Mininet weathermap for more examples. The screen capture above shows top flows, busiest switch ports, and the diameter of the network topology. The Mininet dashboard is a simple application running on the sFlow-RT analytics platform. For a more realistic example, watch the demonstration of SDN leaf and spine traffic engineering recorded at the Open Networking Summit. In the demonstration, a redundant pair of ONOS controllers implement segment routing, using OpenFlow 1.3 to control an eight switch leaf and spine network of commodity switches. Real-time flow analytics drives the dashboards in the demonstration and trigger load balancing of flows across the fabric. Leaf and spine traffic engineering using segment routing and SDN provides a more detailed explanation. Mininet with ONOS and sFlow-RT is a great way to rapidly develop and test SDN applications, avoiding the time and expense involved in setting up a physical network.